I'm still reading, and can't tell you how nice it is to have a library card in hand! I never used the library very much before we went to Europe, but now I'm not sure how I lived without it. The first thing we did after getting our driver's licenses was to go to the library and sign up for a card. I'm looking forward to the summer months and picking up the pace with reading, especially since we have a pool I can sit by! Here are some super quick summaries--maybe you'll find something new to read. PS: 75% of my reading here fits into the Middle Grades or Young Adult category as I'm reading for a MG & YA Writing Class. If you've never read much current MG or YA titles, you might want to try something new and give these a try! #10: Rebecca by Daphne du Maurier. I remember my parents having this movie (directed by Alfred Hitchcock) at home when I was younger, and in my mind I always mixed this title up with Rebecca of Sunnybrook Farm (?!). (Just a Fun Fact, because I'm pretty sure those two books couldn't be any more different!) This Gothic romance takes place on an idyllic English estate and will take you completely by surprise, as everything turns out to be very different than you'd think. #11: The Lacuna by Barbara Kingsolver. I'm slowly but surely reading through all of Kingsolver's novels. This one was very different from the others that I've read by her, and though it wasn't my favorite (The Bean Trees takes the cake), it is clearly a masterpiece. A historical fiction novel, she follows Harrison Shepherd from Mexico to the U.S. as he fights against the rising tide of anti-communist sentiment, weaving in historical characters such as Lev Trotsky, Frida Kahlo, and Diego Rivera along the way. #12: Hush by Jacqueline Woodson. In this Middle Grades novel, a young girl and her family must leave their town and their identities behind when her dad witnesses the murder of a young black boy by white police officers. Woodson's writing is memorable. 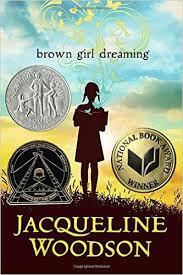 #13: Brown Girl Dreaming by Jacqueline Woodson. Another Middle Grades novel, this memoir written in free verse is so beautiful. Woodson writes about growing up as a black girl in the South, and then moving to Brooklyn where life was very, very different. I especially loved that she was writing about Greenville, SC, where she spent many years of her childhood. If you want something new and different to read and haven't read anything by Jacqueline Woodson, go pick this one up! #14: Rain Reign by Ann M. Martin. This Middle Grades novel is written from the perspective of Rose Howard, a young girl with autism who lives with her emotionally distant father. I really loved this book, and am finding that I especially like reading books from the perspectives of people who have some sort of syndrome or disability--they help me see from their point of view, and that's invaluable. Rose's void is candid and warm, and sometimes humorous: she is obsessed with homonyms and can't understand why everyone else isn't equally interested in them, too. #15: Absolutely Almost by Lisa Graff. Another (!) Middle Grades novel, Absolutely Almost is told from the perspective of Albie, an elementary-school-aged boy who has learning disabilities. It seems like with everything in Albie's life, he's almost (but not quite) good enough. Only when Calista, his afternoon caretaker and friend, sees the best in him does he begin to believe the best about himself. 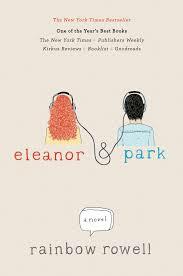 #16: Eleanor & Park by Rainbow Rowell. Eleanor is awkward, overweight, has bright red hair, and wears the worst clothes. Park is cool, half-Asian, wears all black, and likes comics. She stands out, he fits in. But when their worlds collide on the bus, and after a rocky start, Park becomes Eleanor's first friend at her new school. Life is awful at home, but she has Park at school. This is a quirky, funky YA novel set in the '80s (I'm sure kids reading it today are wondering what Walkmans are...)--beware, though, lots of language. #17: The War that Saved My Life by Kimberly Brubaker Bradley. This Middle Grades book follows Ada and Jaimie from the slums of London to the countryside of Kent, England, during WWII, when many children were evacuated due to the fear of bombing in the cities. For the first time in their lives they experience love, compassion, and friendship...but is it real? Or is it too good to be true?